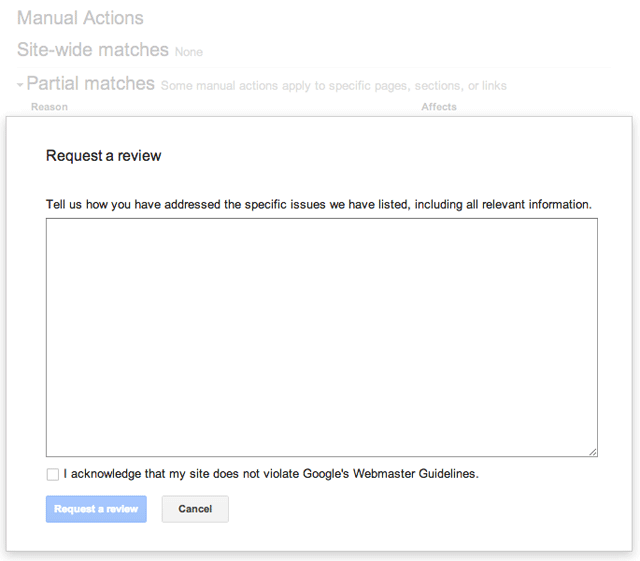 Google Moved The Reconsideration Request Into Manual Actions "Request Review"
Last week, Google launched the new manual actions viewer within Webmaster Tools. Since then, webmasters have been asking where the reconsideration request form has gone. Well, it is now part of manual actions. Why Did Google Remove The Reconsideration Request Form? Why? Well, reconsideration requests only work for manual actions, not for algorithmic actions. So it makes sense that Google only allow you to submit a reconsideration request, which they are now calling "request review," under the manual actions. It will lead to less reconsideration requests for Googlers to review and the requests submitted should be more on target. I know that after this manual actions launched, webmasters and SEOs felt duped. They removed tons of links, disavowed, nofollowed, and spent countless hours fixing things when in fact they either didn't have a manual action or had a manual action that didn't hurt their rankings. So the communication is indeed better right now, but has room to improve. How Do You Submit A Reconsideration Request? Now, you need to login to Webmaster Tools click on "manual actions" under "search traffic" and if there is a manual action you can view it and click "request review." If not, you cannot submit a reconsideration request.